Sandy began on October 22 as a tropical depression off the Coast of Nicaragua. It became a Category 1 hurricane as it moved across the Caribbean. As it continued its move it hit Haiti with twenty inches of rain and nearly 50 people died in mudslides. Sandy continued its non-stop haul with winds up to 110 mph. As Sandy moved away from the Bahamas it headed northeast off the coast of Florida. As it traveled off the coast of North Carolina it met up with other weather factors and picked up momentum and became more destructive. 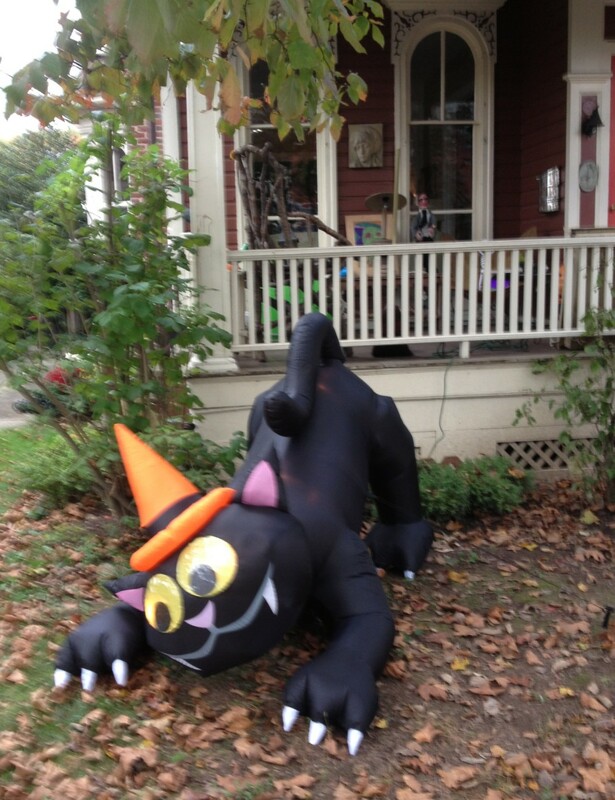 As Sandy continued on to Baltimore, Washington, Philadelphia and New York, a full moon added to Sandy's surge. It now moved from a hurricane to a superstorm. By October 27 both New York's Governor Andrew Cuomo and New Jersey's Governor Chris Christy warned people to prepare for the worst. Evacuations were ordered along the shorelines of both states. At 8:00 p.m. on October 29 Sandy hit near Atlantic City. New Jersey and New York become the hardest hit areas as Sandy pounded the shoreline. 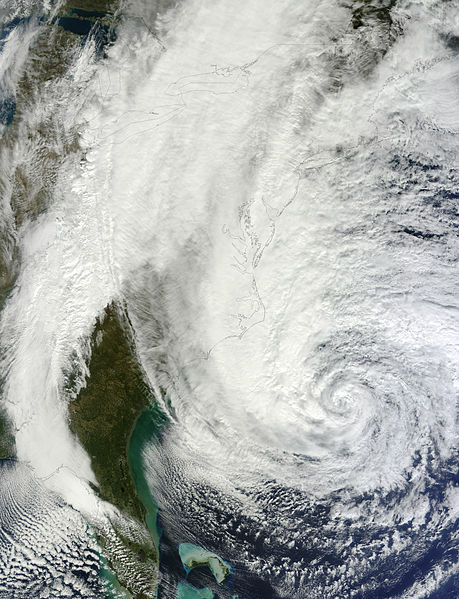 Accuweather stated that Sandy was the strongest hurricane to ever hit the northeast above North Carolina. A storm with a path of over 1200 miles was unprecedented. When Sandy hit it destroyed areas that had never seen such powerful storms before. Boardwalks were actually washed away, berms overflowed and flooded communities, some streets had as much as five feet of water. Other parts of the Jersey shore were under water while some were completely destroyed. I am focusing on the Jersey shore because I have visited it since and know what the current status is in some parts. People across the Nation sent donations to the stricken Northeast Coast. Food, clothing and other necessities were delivered in person, shipped by tractor trailer, air lifted in, and delivered through organizations like the Red Cross. One notable donation came from Actor Alec Baldwin. Long known for his generosity, Mr. Baldwin wanted to help and through Governor Chris Christie he was told about the Manahawkin Community Center which was destroyed by the storm. Mr. Baldwin donated $250,000 to help rebuild the Mill Creek Community Center. Manahawkin is located in Stafford Township in Ocean County,New Jersey. Manahawkin provides the only access to the popular Long Beach Island, which by the way is said to have the softest sand in New Jersey, just saying. 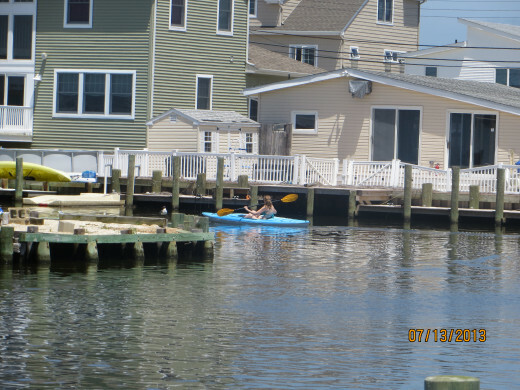 Manahawkin is noted for its canals/lagoons located behind every street. The water comes from the Manahawkin Bay. Just for informational purposes, Manahawkin is a Lenape Indian name that some now believe means "fertile land sloping into the water". I give you this background so you can relate it to the devastation Superstorm Sandy left behind in Manahawkin. Many homes saw four or more feet of water in them. Boats were taken from their moorings and moved to other locations by the rising waters and wind, some landing on porches or in other people's backyards. People's immediate needs of food, clothing, and shelter were met by donations or family members. The National Guard was sent in to help. What about the things not seen on TV? The mail for example? Obviously there was a problem delivering mail to unoccupied or inaccessible homes. What happened to pets? A pet rescue began shortly after the storm. People were not allowed to return to their homes and some spent weeks not knowing what they were facing. Eventually they were allowed to "grab and go" but not to stay. What about now, nine months later? 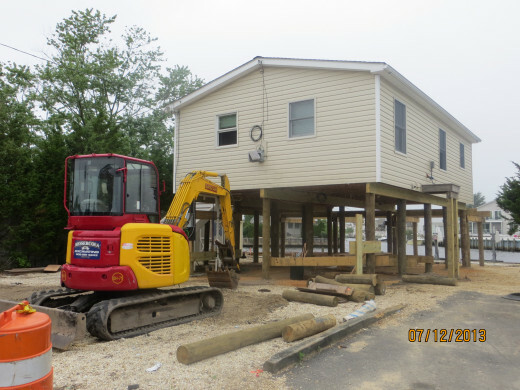 Manahawkin is one of the towns in New Jersey that are still recovering from the storm. Damage was so severe that many people just walked away and left flooded homes as they stood. Some demolished their homes to build new. 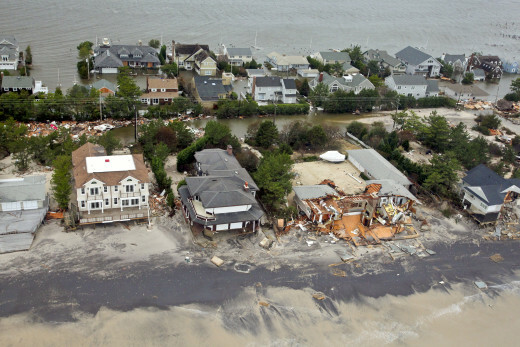 Others kept their homes but raised them to meet insurance standards in case of future flooding, and others still, gutted their homes and started fresh hoping there will never be another Superstorm like Sandy. The Town's budget, like so many others in the same situation, is being overtaken by the expense of post storm clean up; additional people needed to be employed to help with paperwork for the Federal Emergency Management Fund (FEMA) for example. 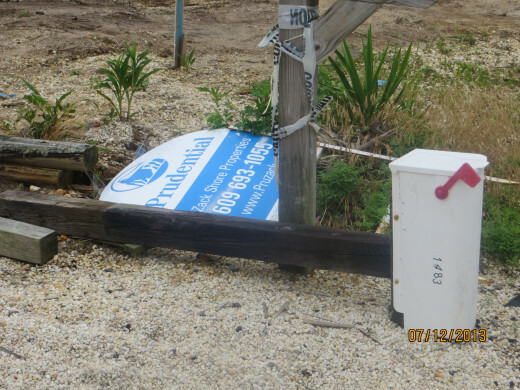 The cost of insurance increased as a result of the storm, many commercial buildings sustained damage that needed to be repaired, and equipment was either damaged or destroyed. 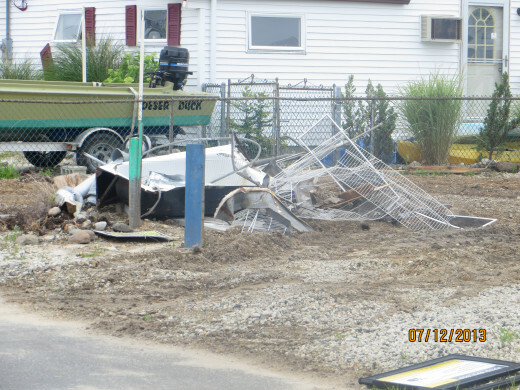 There are stark contrasts on the streets of Manahawkin and no where is it more evident than the homes after the storm. 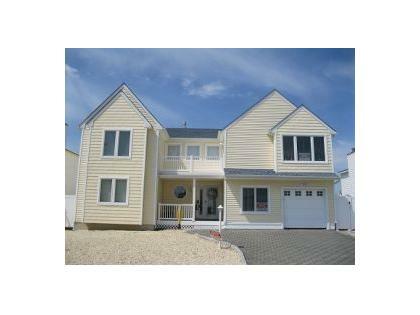 Real Estate listings show many sales stating "house ravaged by Hurricane Sandy, owner unable to rebuild". 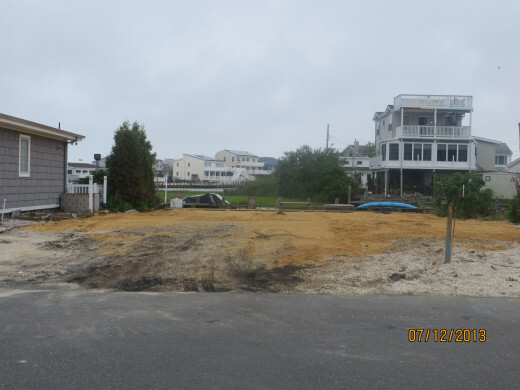 The listing right next to that is for a beautiful home on the bay with six bedrooms, a home theater, full appliance package and protected dock with boat lift - this gorgeous home was somehow not touched by Sandy. See the photo to the right. No damage there! For those homes that are not being sold there are varying degrees of reconstruction. As I said earlier, some are being raised. Of those being raised, some are just shells that still need to be repaired and others were whole houses raised for safety sake. 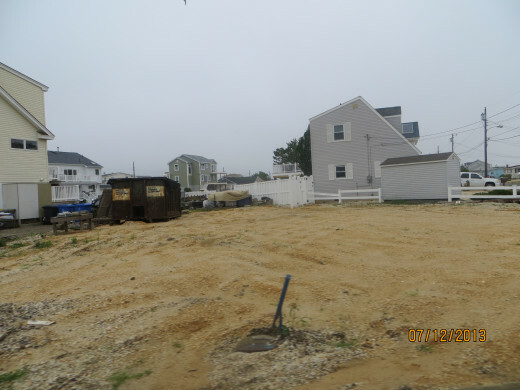 As you walk the streets of Manahawkin you see many empty lots where houses once stood. Some are for sale, others waiting to have new houses built on them. Then there is a series of houses with red stickers in the window marking them for demolition. As my four year old grandson says as we're riding by, "that one's safe for people Mommy, that one's not." Were you, or anyone you know, affected by Superstorm Sandy? Yes, but we are rebuilding. Yes, but only minor damage. No, I live in an area where SS Sandy had no clout. 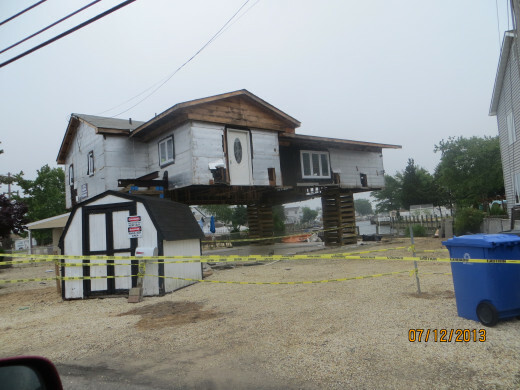 Manahawkin, like other New Jersey towns, will rebuild. People will come back to this tourist town as the landscape begins to return to normal. That return will probably take five years or so but construction will continue and people who love living near the beach won't give up. Stories abound about the generosity and concern people have for each other as they rebuild their community. The First Financial Foundation, a credit union, wanted to help some of its members. In early 2013, donation boxes for cash/change deposits were placed in all five of First Financial’s branch locations with the proceeds going to members in need. This is just one small example of the spirit and generosity in Manahawkin. Many will rebuild their homes, bigger and better, and many newcomers will buy houses or build. This community will continue to be the beautiful place it has always been. If you'd like to read more of my hubs check out my Profile Page. Hey, why not join us? Did you find this interesting? Do you like to write? If you answered yes to either of these questions why not join us here on HubPages? Please look here for more information. Another helpful link for beginners with a short video can be found here. Hope you'll join us soon! Hurricane Awareness - Why Is Mother Nature So Pissed Off? Yes Happyboomernurse they have come a long way but there are still many houses to be rebuilt. So glad you had such a great visit. Ours was good too. Yes, tourists are the heart of the Jersey Shore that's for sure. Thanks for the hugs which, by the way, are coming right back at you. Lastly thanks for the congrats on the Best Avatar. My brother used to live in Manahawkin (about 20 years ago) and it was sad looking at these pictures of devastation. A few weeks ago I met a girlfriend on Long Beach Island. By chance, Governor Christy was there that day because I think another restaurant had just been restored. If one looked closely there was still evidence of damage from Sandy, but not nearly as much as I had feared there would be. Some houses looked like they had been completely rebuilt and others had been raised up. The beach itself looked beautiful and the section we were on had 2 brand new gazebos. Most of the businesses looked open and some of the restaurants had people lined up outside waiting to get in to eat. I was heartened to see so many tourists as that is a good way to help these communities get back on their feet. You are so right Rosemay. It is unfair to add that extra burden of fighting with insurance companies. Thanks for stopping by. You have done a good job of keeping everyone up to date, these desasters are often forgotten and the aftermath is not considered. It must seem like just like yesterday and many will be feeling that their lives will never get back to normal. It is so frustrating when all the red tape takes so long. I know after the Christchurch Quake here in NZ in Feb 2011, there are some who are still waiting for the insurance companies to assess the damage. It is rediculous and extra stress that these people really don't need. Faith, I think that is the best thing we can do for them right now, pray. Pray that they get their insurance money and or FEMA. Pray that they can face the rebuilding and get through this. Thank you dear one and God bless you too. That storm was a monster! There was so much devastation with this storm and I remember many hubber friends who were directly in the path of this monster, but are okay. Yes, those who are still trying to rebuild and have suffered great loss in many ways, still need our prayers and love in reaching out. Thank you for this reminder!!! I am sure it does still feel like just yesterday to those who are still rebuilding and recovering. Who but you my friend would wish me a Ruby Tuesday? Only someone with the wisdom of the sixties where time was never planned! Yes, this was a tragic event and like those on our coastline, I'm sure the people of Kaua'i will never forget. So glad your family was spared. Sadness seeps in with the flood water and only time can dry it out. Thank you for the lovely compliment my friend. The honor is mine...to have you say that and to have you as a follower....remember the mutual admiration society ;) Aloha. Mary, thank you for this reminder. It's very important that we here on the west coast are kept abreast of the reconstruction progress. Just a few decades ago, a massive hurricane made the Garden Island of Kaua'i look like the surface of the moon. I'm thankful that my loved ones were spared, and I watched from afar as the spirited island people rebuilt their homes, and the island's foliage returned. In like manner, I am in awe of the collective efforts and perseverance demonstrated by the survivors of Hurricane Sandy. You're a writer with great range, Mary, and I am honored to be a follower of your work. Aloha, and have a Ruby Tuesday, my friend! So sorry to hear that Vinaya. Water is so powerful we sometimes forget. Glad you enjoyed. storms are quite rare in our country, however, we worry about flood. In the last few weeks at least 100 people have already died because of flood. Your article points some useful tips on how to normalize life after the calamity. Thank you Pamela. It is so true we don't even think of the mundane things that are effected by such a disaster, unless of course we've ever been part of one. Your up vote is appreciated. This is a useful and interesting article. The TV is flooded with pictures for a week or two, then you don't hear anymore. It does take so long to fully recover and we need to realize that. You did an excellent job of pointing out all the things that you might not think of if you have not lived through a diaster of that nature. It is so sad that so many lost everything. Voted up! Thanks Eddy, your opinions mean a lot. Have a good week. A great hub Mary;so very well written and interesting. Voted up and enjoy your day. Thank you Vicki. I appreciate the compliments on my writing and my choice of subject. You make a good point Moonlake. The media moves on but even so, many people forget as they go about their daily lives. Thanks for the vote and share! Michael, you're making me think its a male thing...my husband says the same thing. I think like anything else, when you are raised in an area or have lived there for many years it is hard to leave, even when you've lost everything and have to start all over. Thanks for reading and commenting, you always leave interesting comments. Wow, interesting write Mary .. why people want to live so close to the ocean is a puzzle to me ..but if they want to live there that is there decision. Many factors affect the decisions they make .. myself , after once flooded ..I am gone. Thanks for the update on Sandy. It's not so much all of us that forget about Sandy a few months later. It's has a lot to do with the news media never going back and showing us what is happening but you have with this hub. Voted up and Shared. Really interesting and factual Hub, Mary. Your photos are dramatic and your writing compells us to remember the incredible devastation to so many families who suffer today, many months later. Thank you for this. Thank you aviannovice. I felt it wouldn't hurt to remind people its not over for those living on the coast. I'm glad that you did a story on this after the passage of time. It shows people how ravaged it was and that the residents still need help. It pleases me to see how generous people were for this devastating storm. I lived on the east coast in Maine, which was relatively safe from storms like these. Yes Linda, the government still seems to be unable to get things straight. FEMA applications are still waiting to be answered and many businesses have been affected along with the townships...of course many individuals as well. You are so lucky Nell. Seems our country is having one disaster after another. The closer to home it hits the better you remember it. That is true Rajan. So many people helping others, even when they were in dire straits themselves. 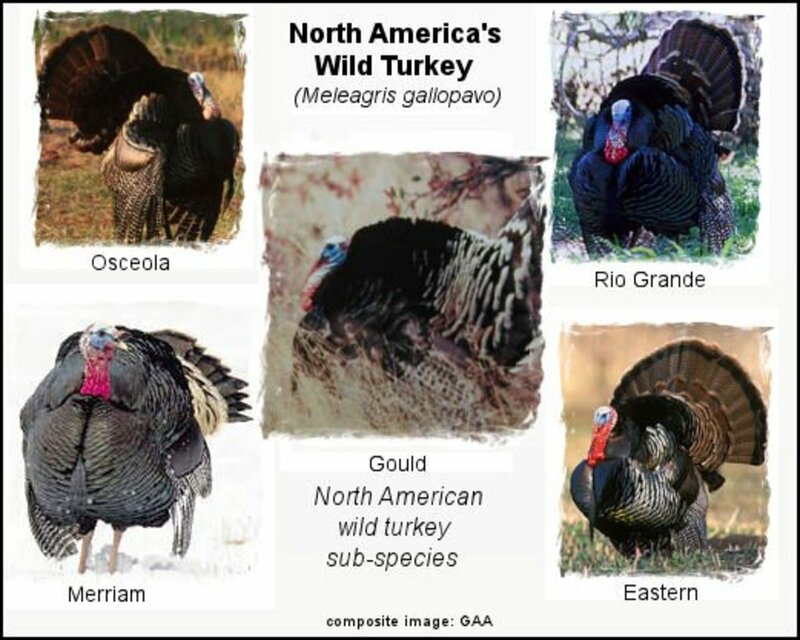 We do wonder what has brought on these "freak" events of nature. This town is close to my heart because of my daughter's house there. Little by little they will rebuild but it was just so sad to see how much still needs to be done. Hope you have a great Sunday. I know Macteacher. My niece lives in Howard Beach but fortunately most of the damage to her house was in her basement. She did however lose two cars! People need to be reminded its not over yet for those so directly affected. Thank you for stopping by. Thanks Michelle. We are certainly hoping this is a once in a lifetime event. I know you are aware first-hand B2B after the fire....it is always so hard when your home is so badly affected, your 'secure' place. I know of people who had $300,000 homes with $300,000 worth of insurance. When it came time to settle the insurance companies were offering $30,000...really? I think there's something wrong with THAT picture! Thank you for remembering my daughter. Her husband gutted the house and redid the entire inside. It is beautiful. 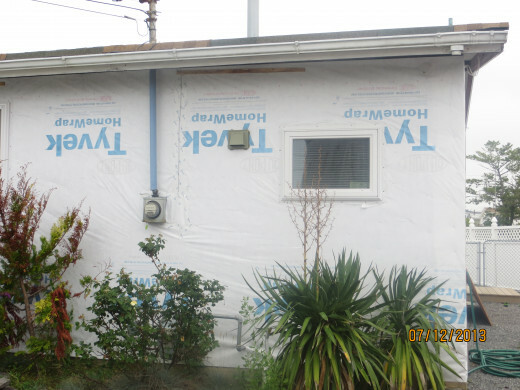 As for the outside, hers was the picture waiting for siding. I know Bill, we here in upstate NY were relieved as well. The coast of NY and NJ has never had such a powerful storm! Thanks for the votes and shares. Enjoy your Sunday! Thank you Mike, for reading and commenting. Thank you sgbrown. That was my first thought when I saw these homes and empty lots...people don't realize its not over yet. I appreciate your votes. You're welcome Stephanie. The human spirit, though wounded, never dies. Efforts will continue but I wanted people to know they're not done yet. 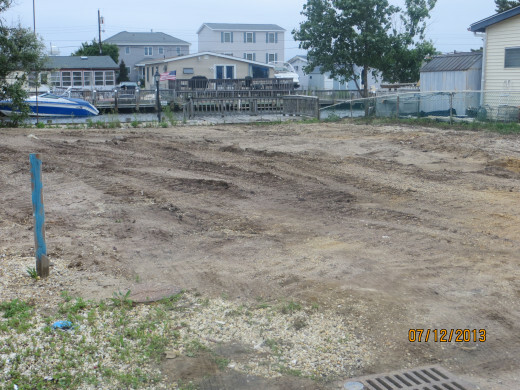 I spent my childhood summers on the Jersey shore, and the damage done by Sandy broke my heart. As often happens after such devastating natural disasters, people who were affected continue to try to rebuild their lives long after the rest of us forget. Thanks for bringing us the story of one town's recovery efforts. It was an informative and very interesting read. It is true that as time passes, many people who were not directly affected by devastation like this, tend to forget that much of the damage and despair still remains. It is good of you to remind us that there are so many people along the coast that still need or help and prayers. Voting this us and awsesome! Very interesting hub about a devastating event. Many thanks! Hi Mary. How sad that so many people were affected by Sandy. I remember our relief here in New England when the storm took that left hand turn and hit NJ and NY. Although much of New England was spared it unfortunately meant that much more destruction along the New Jersey coast. 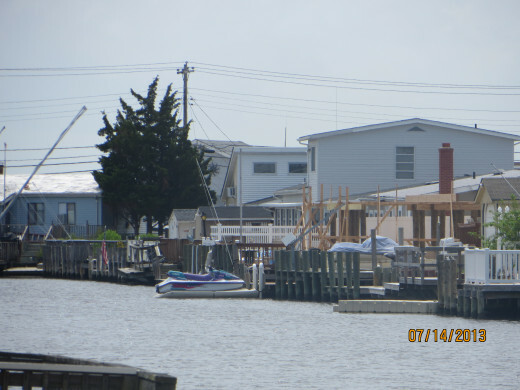 Thanks for bringing us this first hand account of the recovery in Manahawkin. Have a great day. Voted up and shared. Your opening photograph said more than a thousand words ever could. Good luck to all those affected by the storm I hope they eventually rebuild and feel safe or find peace in another location. I know from personnel experience , all you want to do when you are eventually let back to your home after some devastating event is start the clean up and putting right, shame on the insurance company´s mentioned in the video for making a terrible situation so much worse. Thank god when I was hit by a wildfire that my insurance broker and company acted so quickly. I remember from your original hub on Sandy that your daughter had been flooded out; I do hope she has things back up to scratch now and has been paid out on her insurance too. I certainly hope that no one will ever have to experience this again. A well-researched and thorough write up! Hurricane Sandy left a lasting impact in this area. Whole neighborhoods were destroyed in New Jersey and New York City. It will take years to bounce back. Great hub, and thanks for reminding everyone about the long lasting effects of that horrendous storm. I liked reading about this. It was devastating to see how much damage the storm did, especially to New Jersey. I haven't forgotten, and fortunately there are updates on the progress every once in a while on the news. Thanks for sharing the story of this town with us, and the photos. It is interesting to get a glimpse into an area that is not shown on tv as much as some areas are. My thoughts are with these people who are still recovering from it. The human surface of mankind always comes to the fore in times like these and it is heartening to know that donations have poured in to rebuild what has been damaged or lost. Nature is all to powerful and I feel somewhere along the way we are messing with it for it to turn so violent increasingly. Mary, this is a great follow up to the storm of the century. The mainstream media has moved on but for those affected by the storm, that has been difficult. Voted across the board and will be sharing and linking back to my hub on how our government failed the people of the the North East after this tragedy. Awesome job and great photos too. True Bill. Spending time in the area recently and seeing just how much still needs to be done really hit home. People do need to know. Have a great weekend my friend. Maria I am glad I could add that tid bit about Alec Baldwin. Dawn, of course, lives on in memories and thoughts. We really just need to be ourselves and always willing to help our neighbor. Hugs GF. You're so right Effer. This is something they will never forget. Seeing your refrigerator floating in your living room leaves a pretty lasting impression ;) or your boat sitting on your neighbor's back porch. We sometimes need to be reminded lest we forget those still dealing with it. Sending angels your way GF. Til.....Fantastic reporting, lending recall to super storm, "Sandy." Bill's comment, in terms of how people "tend to forget," hits a common thread of human nature. Your description and photos make it all too real, once more. For those who suffered Sandy's wrath, the devastation, even after complete recovery, will surely remain. 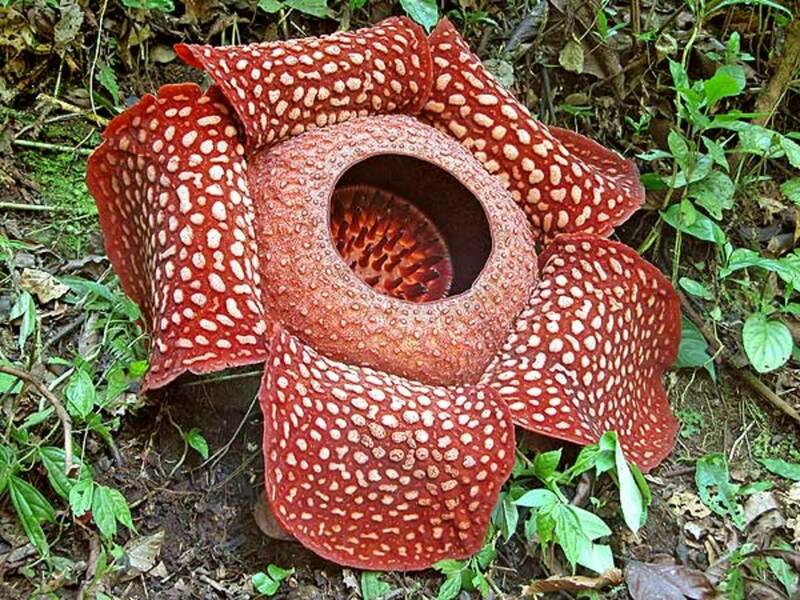 Mother Nature has the force of power and control, to bring her inhabitants to our knees. This reminds me of the fleeting passage of time, Mary. To those whose lives were uprooted, forever changed, this may seem like yesterday. I appreciate learning about generous people like Alec Baldwin. My husband and I will never forget this storm, as we ultimately lost Dawn...who fell down the steps in a power outage. Such natural disasters are so out of our control. Yet, the humanity and kindness shown to others after is always in our power. Thanks for keeping this issue in the forefront. It's an interesting topic, Mary. People tend to forget these events six months after they have happened, thinking that since the storm is gone then everything is back to normal. I have a friend who lives in Joplin, Missouri, and two years after the tornado hit there the city is still trying to recover from the devastation. Thanks for resurrecting this story; people need to know.